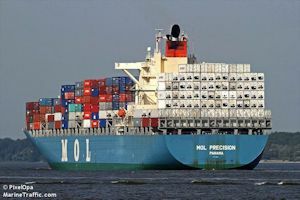 After missing a further two sailings we finally managed to get the sea kayaks on a container ship out of Los Angeles. This ship is now docked in Manzanillo, Mexico and our container has been offloaded awaiting MOL Precision to take it the final leg to Lima. I’ve updated the Where are they now? page to track MOL Precision. Fingers crossed they’ll get to Lima safely and clear customs by the time we need them!